Basically the Minamoto and the Taira, both warrior clans with hereditary links to the Imperial family, were in a massively bloody feud mostly fueled by the desire to control the Imperial court. Gozen was Yoshinaka’s premier military commander and always rode into battle at the head of the army. She was a skilled horsewoman and was as deadly with a bow as she was with a sword. She was also a brilliant (although perhaps underhanded) strategist. In one battle against the Taira her army marched up to them carrying the red flags of the Taira clan, then as they reached the front lines switched to white and slaughtered hundreds. Another anecdote has Gozen and Yoshinaka challenging Taira clan members to duels, and while Taira clan members were busy watching the fights, Minamoto armies flanked them from behind and slaughtered them. Tomoe Gozen was just as ruthless against the advances of men. One story has a samurai by the name of Uchida Iyeyoshi attempting to claim her as his wife. As he tried to pull her from her horse he ripped her sleeve. Gozen apparently really loved that shirt because she responded by decapitating Uchida and kicking his headless corpse into an acid-filled ditch. 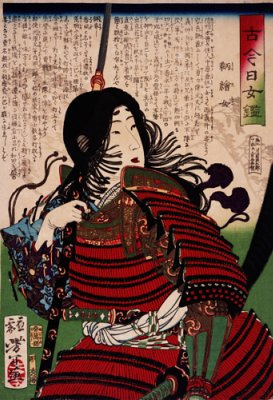 Unfortunately, a pretty notoriously fierce samurai known as Onada Moroshige stood in her way. Onada was a intimidating fighter from the Musashi province and was known for his unrivaled strength and swordsmanship. Tomoe must have missed that memo because she charged straight towards him at a full gallop, unseated him from his horse, and then pinning him against her thigh decapitated him (some say with a dagger, some say with her bare hands). She held the head up for Yoshinaka to see that she was unharmed and victoriously rode off. Not much else is known about her beyond her military exploits. McCullough, Helen, trans. The Tale of the Heike. Palo Alto: Stanford University Press, 1990. Thompson, Ben. Badass: A Relentless Onslaught of the Toughest Warlords, Vikings, Samurai, Pirates, Gunfighters, and Military Commanders to Ever Live. New York: William Morrow, 2009. Turnbull, Stephen. Samurai Women 1184-1877 (Warrior). Oxford: Osprey Publishing, 2010.